Total Beauty will be doing these amazing hair and makeup makeovers in the LA area monthly and is in need of women to make over. If you know, or are, a women in this area who needs or would want a makeover, leave a comment and we can connect and I can get your info. I will also need to know why they need a makeover and a recent photo( not in the comments , of course). Total Beauty is looking for women in their 30s and 40s mostly. I will pass it on to Kristen out there . She will take it from there and contact you if you are chosen. This is what landed under my tree this year. I picked out 2 of the Paul and Joe Disney items back in November. Limited and looking to sell fast , I ordered early. 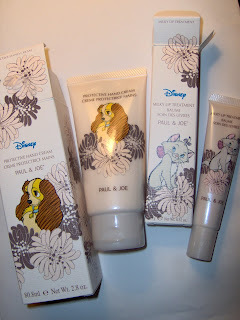 The hand cream features Lady of Lady and The Tramp and is ultra cute. This is not technicolor Disney but the soignee French version. It's very dainty and old fashioned vanity looking. The Protective Hand Cream itself has a slight scent of oranges and cream, making it a tiny bit like a creamsicle. It's very subtle. 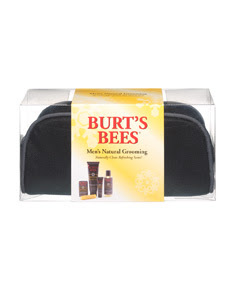 I have only tried a small amount thus far, but it seems to have medium moisture and it absorbs fast. The Milky Lip Treatment features the Aristocats. This is very creamy and has loads of moisture. It also has a tiny bit of shimmer and a barely visible tint. Both the lip treat and hand cream get their moisture from jojoba oils. I remember when Sephora used to stock Paul and Joe. It's a great line and would be nice if they still did. Mission skincare is a new line of athlete inspired products , called "high-performance, athlete-engineered skincare™ "
" Engineered in MISSION Labs, the entire MISSION Product line is designed, and has been proven, to meet the specific needs of athletes across all sports. With vital nutrients and antioxidants, MISSION Product™ is the best equipment for your skin, allowing athletes to focus on their sport and maximize their performance." Now what does all that mean to me? It means great lip balms, and I can totally get behind that. Misson has 4 balms . 3 Lip Balmer SPF 15 and Lip Protector SPF20 which I am wearing as I type this. They all smell great and work well, but I am partial to the Orange of course. It kind of tastes like Tang if I recall that taste correctly. The Sweet Vanilla is super sweet and cookie like. If you like the Philosophy 3in1s , then you need this lip balm. They all last really long and moisturize well., They have no color or shine and come in very neutral tubes. These are unisex for all. 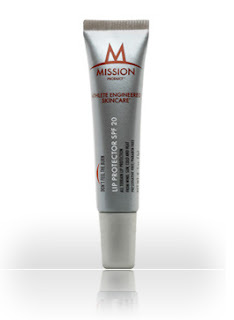 The Lip Protector SPF 20 is the more endurance version. It is in a squeeze tube and more emollient. 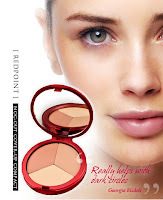 It has stronger SPF, and a hint of gloss shine that make it even more of a barrier to wind etc. All of these are paraben and preservative free, have Vitamin E, and moisturizing oils which vary depending on flavor. 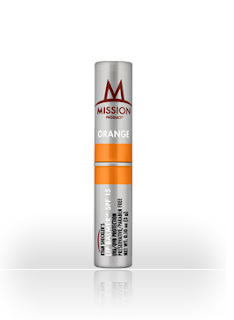 Mission also has an SPF 30 stick called Daily Offense that is on my to buy list. Easy to swipe on any time, it is sweat resistant and anti sting. Rounding out the line are Foot Synergy Gel and After Sun Gel. Thanks SO much to all of you who entered the contest. I truly wish I could make each of you a winner. After I randomly picked my winner( so no bias) I read each entry well, and so many of you made me want you to have it most of all. The harried mom of 2( sounds like one of my BFFs) The snowed in vet,( As a major dog lover, I have a soft spot for vets) , the broke college students, etc. But there can only be one, and I did it random as I said to be fair, so congrats to WOOSTER. Please let me know your email or leave me a comment here and I can get you mine. whichever works for you. I would like to have the winners info by Tues. the 30th ,as the company would like it by years end. If I do not hear from the winner by Jan. 1, I will pick a new one. Thanks again , come back and visit. 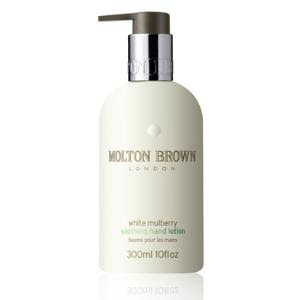 Join Molton Brown beginning December 26th to celebrate the Holidays with two very special events: Boxing Day and the limited return of the vitalising vitamin A,B+C bath & shower. Visit any Molton Brown emporia in the US and celebrate Boxing Day, a British holiday tradition of giving back to those in need. Simply bring unwrapped toys to any Molton Brown location on December 26th, 27th, and 28th and your toy will be donated to Boys and Girls Clubs of America (visit http://www.bgca.org/ for more information on Boys and Girls Clubs). While in store, be on the lookout for the re-launch of the vitalizing vitamin AB+C bath & shower. This limited edition shower gel is being brought back by popular demand especially for the holidays. At the end of your visits, they will receive a complimentary travel-sized product for each donated gift (limit of five complimentary gifts per individual, while supplies last) and you will be eligible to enter to win an assortment of Molton Brown products. Taking a few days off to enjoy the season and get things wrapped up, literally. I wish all of you the merriest and blessed of holidays. I will be back on the 26th with a new post. 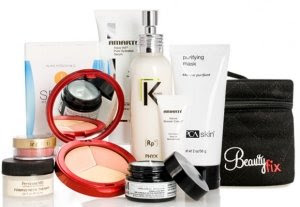 Don't forgot you have until the 27th to enter and win the super Beautyfix kit full of products. I was persuing Saks.com yesterday and saw that a number of Bobbi Brown palettes and brush sets, as well as several Laura Mercier makeup or bath sets ( Yes, Creme Brulee) were in the sale section. Most are reduced by around 10.00 and there was a free express shipping code at the top of the page to make it for the holiday. Precriptives.com is also offering a nice sample trio with purchase . Frees express ship here too. 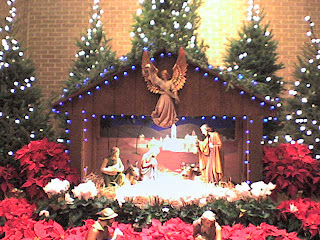 Now through 3 PM EST on December 22, 2008. Use code 2NDSHIP at check out. If you wait until Dec. 23 rd,you can get FREE Overnight Shipping using code FNIGHT8. The code is only valid on December 23, 2008 until 1 PM EST. The Latest Holiday Beauty Deals Addicted To Lipstick Has put together a list of all the Holiday beauty deals you can find this week on the web. Click here for all the latest beauty deals and steals to buy. 3 more budget beauty buys for your last minute shopping. These are especially great for tweens or teens . Ruby- Peach, Rose, and Vanilla. Blue Opal- my favorite of the 3, a slightly aquatic floral. Watermelon and Lilac. Purple Diamond-blackcurrant, jasmine. It also has a tinge of musk to my nose and the blackcurrant is very prominent. The set of 3 sells for $20.00. -Kiss has always been leader in nail products and here are two easy to find and use kits that almost any woman could use. 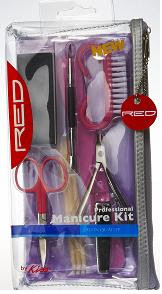 These are perfect " extras" or go great with a nice set of nail polsihes or a gift card for a salon service. 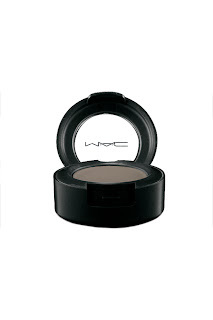 Just in time to spend your holiday gift cards MAC has the Chill Collection of pretty wintry pales. Some of these are new, some re-promotes. in a modern, plastic barrel with cap package that provides precise and bold line application. The carbon black pigment provides therichest and deepest black. LASHES 41 Slightly more dramatic length than other M·A·C Lashes. Overlapping hairs give a luxe, lush look. Carelle jewelry is having a quick online sale today. Just from 11- 3 EST. 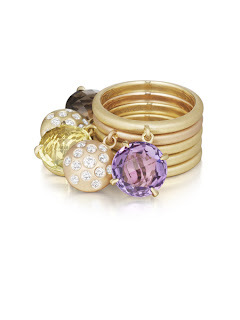 I love these stackable rings, but not sure what will be in the sale. If you shop, share what you caved on. Time for a holiday contest. Get a gift after the holiday delivered right to you. I have 1 inaugural set of the Beautyfix kit of mostly full size beauty product samples to give away. 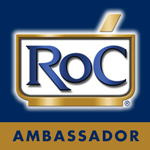 I have have had my box for about a month now and really liked many of the products. Top favs include the Redpoint Noc Out concealer( the mom made off with this, she said it was as good as her fav Vincent Longo), MLAB Anti-aging cream( I reviewed this line in October, extremely good quality), and the Jane Iredale Iridescent powder( a pretty, highly pigmented pink-peach powder/blush).Oh, and the uber expensive Perricone even has a product in there. All you need to do is leave a comment under this post. Thats it. I will take entries until 11PM EST Dec. 27th. I will announce the winner here on Dec. 28th. Kit contains: 24-Karat Gold Dust Powder by Jane Iredale, Phyx Overnight Repair Masque by Kronos, Anti-Aging Treatment Cream by M Lab, pHaze 9 Purifying Mask by PCA Skin, Firming Neck Therapy by PerriconeMD Cosmeceuticals, NOC-Out Cover-Up Compact by Redpoint, a 15-day trial from weight-loss resource Sensa, an Aqua Veil Pure Hydration Serum and Natural Wonder Cream by Amarté, a Korean brand that is being introduced in the U.S., and a train case makeup bag. If you should decide you want to join up with BeautyFix it's 50.00 per quarter for each box of goodies. Each kit will include at least 7 items. If you want a box of skincare and makeup to land on your door, this might just be for you. http://www.beautyfix.com/ for more info/to see products. Either way, enter to win this kit today. The Beauty Alchemist not responsible for :lost entries, shipping of prize, prize not arriving at destination, condition of prize upon arrival. Phyto is having a 40-50% off promotion via their Friends & Family Sale. Enter code FFDEC8 at the top of the page to view sale prices. Yet another rare discount on a great brand. This ends December 18 at 5pm EST. 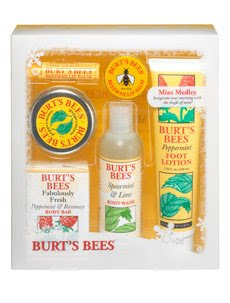 Dashing through Target recently, I noticed a lot of nice Burts Bees gift sets. 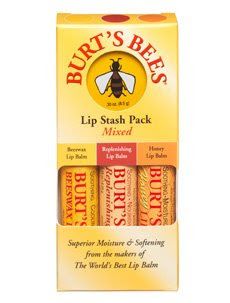 Burts Bees makes great natural ( no parabens, animal testing, phthalates) products. I thought that it was great that one could buy a quality gift set at easy to get to stores like Target and Walgreens, and not spend over 20.00 on them. In fact some are 15.00 or less. If you are pressed for time or live in an area of minimal shopping choices, you may want to check these out. I can't imagine anyone being disappointed. Here are a few highlights, there are more on the company website or in stores. This mens set is perfect for the business travler. The aftershave is a lotion that is non greasy and has a light pleasant smell. Plus it's tough to find something for the guys sometimes. This is manly yet good for their skin. I also saw on the website as well that they are offering free gifts when you make a purchase of $25, $50 or $75. If you want to do online buying, shipping is only 2.95. 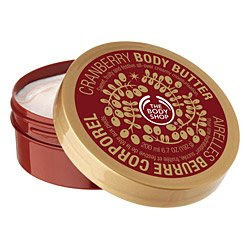 If it's Christmas time then that means the return of the most beautiful smelling Cranberry line from The Body Shop. The Cranberry is my absolute favorite of any brand and I stock up every year at Christmas. There are 2 other holiday scents. Vanilla Spice returns and Warm Amber is new. You simply can't beat this line for quality of scent, I think. More good news: The Body Butters are now paraben/preservative free. Glad to see that. I just tried the Warm Amber this weekend. This is the scent to go with if you or your giftee isn't into fruit or floral smells. It is cozy, and yes, warm. Not too strong, but the scent lingers long from the lotion. All 3 holiday scents are only available through January, at best and now they are all 50% off . For instance The Body Butter is 10.00, Shower Gel 6.50, Hand Soap $ 5.00 ( a big fav here). All gift sets are 50% off as well. These make great gifts , so grab a good deal while you can. The holiday collection is full of options from the “Smart Gifts” “Gifts that Give the Earth” and “Recessionista” categories. They also want people to : “Rejoice, Reuse and Recycle!” You can find smart gifts that don’t cost the earth and just might leave a little extra left over for that special treat you’ll desperately need after the holidays! One treat of the Holiday season is new Lush Solid perfumes. I love solid perfumes , so this is cause for great excitement here and I finally got my hands on most of the new ones . There are 4 new scents( one is a repromote). Sakura, The Comforter, Snow Showers and Olive Branch. Sakura is powder soft light floral of mainly Cherry Blossom & and Mimosa . It is very light but not barely there if that makes any sense. It also has a very Springlike quality. A great subtle scent. Snow Showers is the return of last year's great Champagne Snow Showers. One of my favorite scents, not just from Lush, but period. Lush calls it their version of a Bucks Fizz which is a British drink and also my favorute truffle flavor by Charbonnel et Walker chocolates. ( Haven't had the drink). It has cognac and orange oils and is just yummy. The cognac doesn't give it an alchohol smell just deepens the citrus and gives it a smooth edge. The scent is very much like last years version. The Comforter has a very berry scent but with a hint of almost menthol from the Cypress oil. The bergamot is pretty quiet in this and the Cassis berry is strong. This is the strongest smelling of the group with the Cassis packing a punch. This scent lasts the longest. Olive Branch is the one I haven't tried, but it is a citrus with bergamot, orange, lemon and orange flower and sounds really nice. All of these are Vegan, made with a cocoa butter and wax base and come in a small tin that are very portable. They don't last overly long and can be re-applied through the day. Great to keep in your purse or drawer for touch ups. I do not know if these are LE or permanent. Butterfly Diary has the First Mail of Christmas for all you gift lovers! Check it out here and cherry pick some nifty, unique items for everyone on your list. 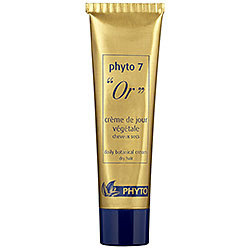 Phyto 7 Gold is a daily hydrator made from botanicals. You use it after washing , and apply to towel dry hair. After applying to hair, style as usual. 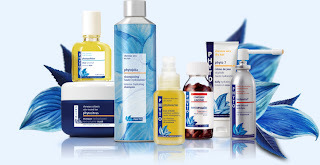 Phyto calls it a " day cream" for hair. The cream is not greasy and really moisturizes hair. Tames the flyaways and smooths. I use it all the time . I have never used something in a leave in this good and without any feel of it in my hair. I have rediscovered Prescriptives this fall. Many years ago I used this line a lot. I have what could truly be called vintage Prescriptives at this point. One of their newest products for Fall/Winter is Winter Reflections All Over Highlighter. I always loved those little ball highlighters but hadn't used any in a long time. ( Again, I still have some vintage qualifying ones from ye olde days). Meteorites are beautiful but not enough pigment. 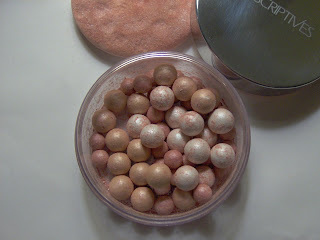 These have pigment and can even be used as a light blush. Very pretty, with a tiny bit of shimmer but not much. 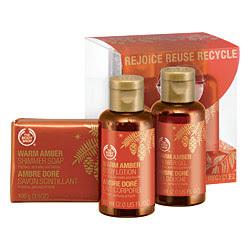 -Special online price reductions on some of their limited Holiday Gift Sets . Shop online for your favorite Holiday Gift Set and take advantage of these great deals! Can I tell you how amazed I continually am at the quality of beauty brands that land on home shopping channels? It's great to see these brands accessible to everyone. There are plenty of places where there are no makeup counters, so this fits the bill. Lancome is joining the ranks today. They will have flex pay & free shipping. Representing Lancôme will be the glamorous Joan Poulton, vice president of education who has an amazing amount of product knowledge. The star product of the show will be Ôscillation, our red-hot vibrating powermascara. Joan will discuss why Ôscillation is the mascara of the year and show how this innovative product is so revolutionary. She'll also showcase two of Lancôme's cult products: Bi-Facil, the must-have eye makeup remover, and Cils Booster XL, the best-selling luxury lash primer around. 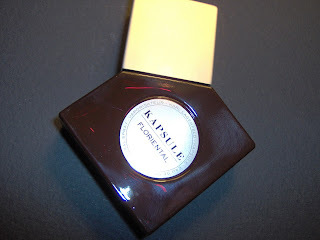 Last month the Kapsule set of fragrances by Karl Lagerfeld finally hit stores. It seems I had read about them so long ago. These are 3 scents that KL had developed, meant to be worn by men or women, and individually or mixed. I can attest to the unisex factor in them, but I am not sure I would mix them. They seem fine each on their own. The 3 scents are all nicely done , well blended and evolve from start to drydown. They also come in rather neat, geometric bottles in rich colors. Floriental-This one is the least unisex to my nose and more feminine . It is very spicy right off , then some green notes , perhaps a little vetiver? As it dries down, it is a very warm fragrance. The smoky spiciness continues but not in a strong way . This is not a heavy scent or loud. It is actually soft with medium sillage. It seems sophisticated and by the drydown has become a bit more floral. This one comes in a dark red bottle I just love. Light- The most masculine scent to me. Light is aquatic with a hint of sweetness( blood orange note). Nutmeg and Clove give a barely there spicy-ness. It has a musky edge at times and again, is not overly strong, but very long lasting. This has a resemblance to some other men's fragrances out there. Woody- Again a very unisex composition. This one is all woods . You smell the forest, and moss. The plum note gives a bit of a dried fruit note midway, and mingles with the cedar. By the full drydown there is a incense note as well. The scents are sold exclusively for now ( in US) at Neiman Marcus. International outlets listed on website. $ 110.00 each for 2.5 oz. 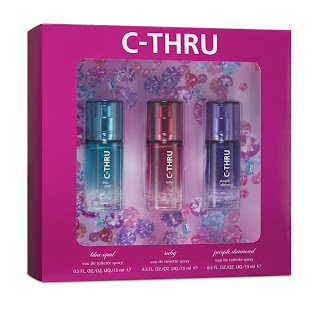 or the set of the three for 150.00 ( 3 one ounce bottles). Great Brit brand Eve Lom has landed on our shores . Now carried at Beauty.com as well as SpaceNK. I've read many great things about this line . Among others- Vogue mag called the cleanser the best ever. I've been using the Cuticle Cream lately. Winter always bring a big need for hand creams, nails creams etc. The best I used was a Swiss brand that I haven't found in years. I'm glad to have a new one on, well, hand. 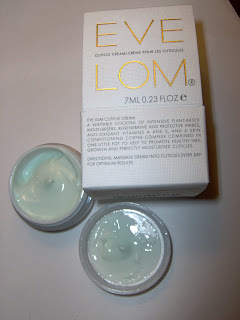 The Eve Lom version is a tiny pot, but that pot holds a lot and a little goes a very long way. You really need just a dab . 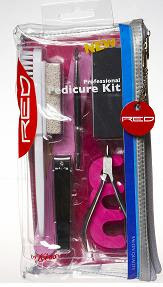 It imparts a high shine to the nail bed as well as tons of moisture. All that oil doesn't make it greasy though. It dries quite fast and sinks in. It also seems to last through at least one hand washing. My nails are looking much shinier all the time now since using this and I haven't even used it every day. There are loads of oils in this to help nails- Sweet Almond, Eucalyptus, Clove, Camomile, Soybean, Hops and a few more. Eve Lom Cuticle Cream is described as having "protective waxes, anti-oxidant vitamins A and E, and anti-microbial copper combined in one little pot to help to promote healthy nail growth and perfectly conditioned cuticles." I am also using the DynaSpot Acne treatment. 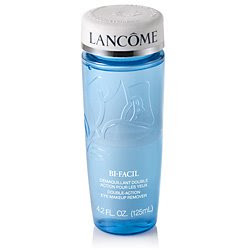 Great for adult acne, as it's gentle with healing oils, but works well. I have discovered what I want for Christmas. I mean, I was just thinking that I need/want very little. A down blanket was pretty well at the top of the list and then I saw THIS. Ok, it's a bit spendy and all, but isn't it beautiful? 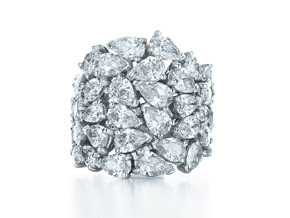 It's the most stunning ring I've seen in awhile, and believe me, I look. Whats your ultimate/ fantasy ( material ) gift ? From many of my posts you can see I am a fragrance lover. One special brand is Caron. I have sniffed many of their scents but far from all and am slowy trying more. On a recent visit to the Caron boutique in PhytoUniverse Spa in NY, I was introduced to Parfum Sacre . On my visit there last year it was Nuit de Noel that was a new try. Two perfumes my friends at Sniffapalooza have long raved about but I had not tried. Both are very oriental and I am hit or miss with that group. But in giving them a chance I am a convert. Both are also very much Holiday scents. 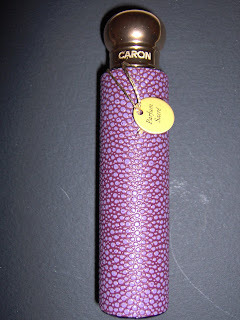 The thing to remember about Caron perfumes is the quality behind them. 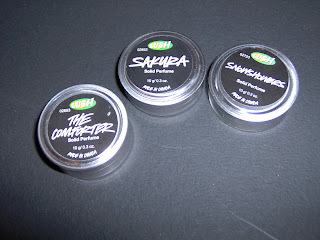 These are well made and blended and they will change on your skin from top notes to drydown. Parfum Sacre is a floral -oriental. It has myrrh which is often a no no for me, but here it is slight and is just there. 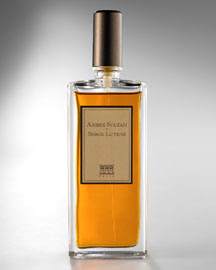 Parfum Sacre begins with a dusky spicy powder, then the clove and musk begin to come out. In the drydown it's all the above notes plus a nice hint of amber, woods and mimosa to make it very warm. Nuit de Noel , lovely enough to begin, after a good drydown was so beautiful. I finally got what the fuss was about. Now this was in pure parfum form, which in any great scent can make you see joy. In EDP it is not quite as deep and rich but still pretty. It has rose ,woods and greens. Perhaps the scent of rose growing in deep woods, near a campfire. Nuit de Noel is a true vintage scent as well, created in 1922. Both of these perfumes are very elegant perfumes. Also great winter scents. Caron has recented brought out Galuchats. Gorgeous leather clad atomizers . The leather is made to look like Shagreen. Each scent comes in a different color. At $75- 85.00 for 1 oz they are well priced . I have seen similar bottles in other brands for much more . Plus, it's Caron. Chic. My favorite Caron is Lady Caron. I have some EDP and I tried this is parfum this time and nearly wept. One to add to the list. Lady Caron is a big but soft while floral. Caron can be ordered via the boutique at 1-877-88CARON, ask for Diane. Right now you get 20% your order from the boutique via Diane. This is a limited offer and I am not sure how long it will be on. Caron never has discounts , so if you want to buy, this is definitely the time to do it. 715 Lexington Ave. at 58th. Bergdorf Goodman is having the last 25.00 off $100 sale of the year. Runs the 4th thru the 6th. This is well worth taking advantage of, as it is good on everything in store incl. fragrance and cosmetics. That means Serge Lutens, Guerlain, Creed, YSL, Prada, Tom Ford, Elemis, Paul and Joe etc. ( Not just whats on the website, the store has everything incl.rare Guerlains). It's pretty rare to ever get a discount on these brands. If the Victoria's Secret Fashion show has you ready to go shopping there, here are two fun and pretty new ideas( albeit non runway ones). One, the Home line, I previewed back at Fashion Week and blogged about it then in September. It's finally in stores and I saw in person again last week. I am partial to the set of boxed soaps. Great gift for almost any woman on your list. 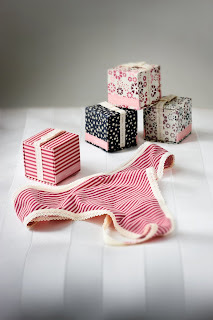 I also saw in store these cute little boxes, and further looking showed they each have undies in them. They are organic cotton and you can get a tank or underwear. They are so cute, and ready to go under the tree just as they are. -Mandarin Woods: An invigorating mix of Mandarin and Alpine greens filtered through chilled winter air. -Vanilla Orchid: A comforting blend of creamy Vanilla and Orchid wrapped in the warmth of soft Musk. 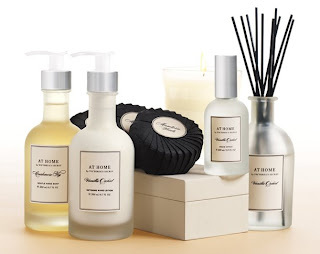 -Cashmere Fig: An earthy combination of Fig and Cashmere Woods on a bed of crushed green leaves. No secret that Ray Ban Wayfarer 's are my favorite sunglasses. and not just recently. Like the sunglasses shown here, think 80s. I always loved them. 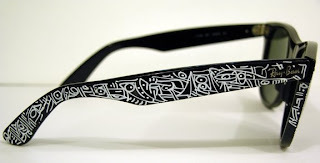 Sunglass Hut is sponsoring a sale of NYC local artist Chris Mendoza's custom painted 100 pairs of Ray-Ban Wayfarer glasses. There are 100 available. The Ray-Ban's are very Pop Art-y. Think Keith Haring. Think 1980's. Think graffiti. 25% of the proceeds go to Give The Gift Of Site. It's a charity that brings glasses (eye tests, etc) to the world's poor including here in the USA. Cases will be signed and numbered. I had a impartial party pick a number out of the numbered entries ,and Congrats to Mandarine ,winner of the Midnight Glam contest. Please contact me with your email . If you don't feel comfortable leaving in a comment, let me know and I will send you one of mine. Winner has until midnight Dec. 5th to contact me, or I will pick a new winner. Thanks to all who entered. I wish I had one for each of you. 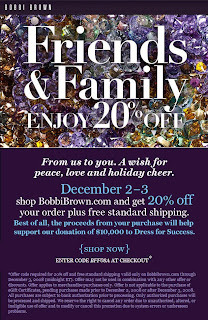 You don't see discounts on Bobbi Brown too often, but through tomorrow Dec.3rd, you can save 20% offf all items incl. gifts and get free shipping at their first ever Friend & Family sale. There is so much to recommend but I'll stick to 2. Right now I can't get enough of the Glitter Lip Balm in Copper Diamond and the Copper Diamond Shimmerbrick. Ok, so the whole Copper Diamond collection is pretty good . Let me know what you cave on.